11 1/2" tall, medium long red hair curled hair, brown eyes, painted eyelashes, (Steffie head mold) bendable legs, twist waist, long green & white checked dress, sheer white long sleeves, black ribbon around waist & bow accent at collar. 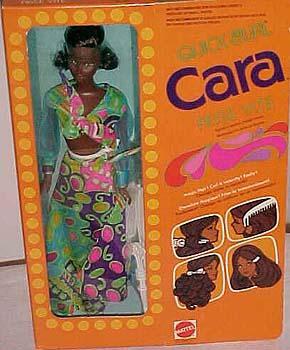 A brush, comb, curlers, rubber bands, bobby pins, posing stand & booklet. 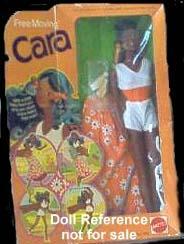 Markings: © 1966 Mattel, Inc. U.S. & Foreign Patented Other Pat's. Pending Made in Taiwan. 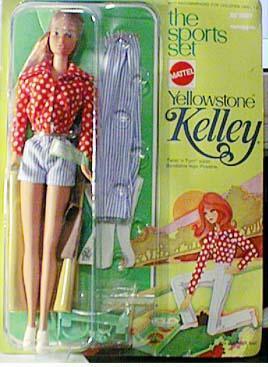 11 1/2" tall, The Sports Set, Yellowstone Kelley has suntan skin tone, long straight red hair with slight color variations, no bangs, bendable legs, twist waist, red and white dotted long sleeve tailored blouse, blue and white striped shorts and slacks, white knee-hi socks, white shoes, sleeping bag, camping gear included. (Steffie head mold) 11 1/2" tall, long brown hair curled in two sections tied in orange ribbon, no bangs, brown eyes, black doll, special tab on back when rotated doll waist bends, twists, bendable legs, one piece sun suit of white with the middle section in orange, matching long floral print skirt in orange, tennis racket, golf club, white ball & white tennis shoes. Markings: © 1967 Mattel, Inc. Taiwan U.S. Pat. Pend. 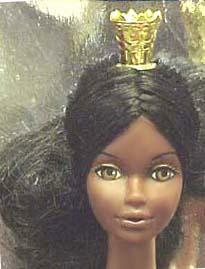 (Steffie head mold) 11 1/2" tall, shoulder length dark brown hair, painted eyelashes, brown eyes, black doll, wore a long wraparound multi-printed skirt, matching midriff tied top, long blue sheer sleeves. Quick curler, comb & brush. Markings: © 1966 Mattel, Inc. U.S. and Foreign Patented Other Pat's Pending Made in Taiwan. (Steffie head mold) 11 1/2" tall, long brown hair hair is in an up flip curl, brown eyes, painted eyelashes, black doll with twist waist, bendable legs, long dress in yellow, white crocheted shawl, white bead necklace, long quick curl fall attached to a yellow ribbon, comb, brush, curler, yellow pilgrim shoes. Markings: ©1966 Mattel, Inc. U.S. & Foreign Patented Other Pat's. Pending Made in Taiwan. (Steffie head mold) 11 1/2" tall, painted eyelashes, brown eyes, black ponytail hair do, black doll wore a gold crown, wore a pink & gold trimmed tutu, ballet slippers, pink posing stand and red bouquet of flowers. Doll has specially constructed legs for posing like a real ballerina. Marking: © Mattel, Inc. 1966 U.S. Patent Pending Taiwan.